Phew. What a week. Due to a recent entree into personal cheffing, I tackled three different Thanksgiving feasts for family and friends over the course of the past four days. That's 2 turkeys, 5 forms of potato, 3 stuffings, upwards of 10 vegetable sides, 3 bowls of cranberry sauce, 1 tart, three pies, and about 2,000 plays of Adele's Hello. Long story short, I'm pretty happy to be sitting right now. I'm not gonna lie, I felt a pretty big, turkey-shaped guilt pang not putting anything out into the blogosphere in anticipation of Thanksgiving. 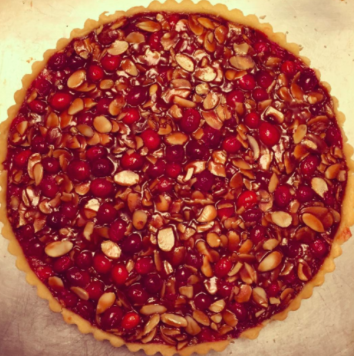 Not only is it my favorite holiday, but my favorite meal to cook, the day dedicated to my favorite dessert, and the first Thanksgiving to debut on Mad on Food. Enter shame spiral. The dread did dissipate though with the prospect of leftovers. I guess my head has been in such manic, cooking mode the past few days that I completely forgot about the blissful week of perpetually reheated Thanksgiving meals and every reincarnate of turkey imaginable. So I know I'm a bit late, but this is where I want to pick up now. Leftovers. Anybody ever heard of stack pie? I hadn't until a few years ago after reading this NYT article and thought of it yesterday in thinking about what subject to tackle here. 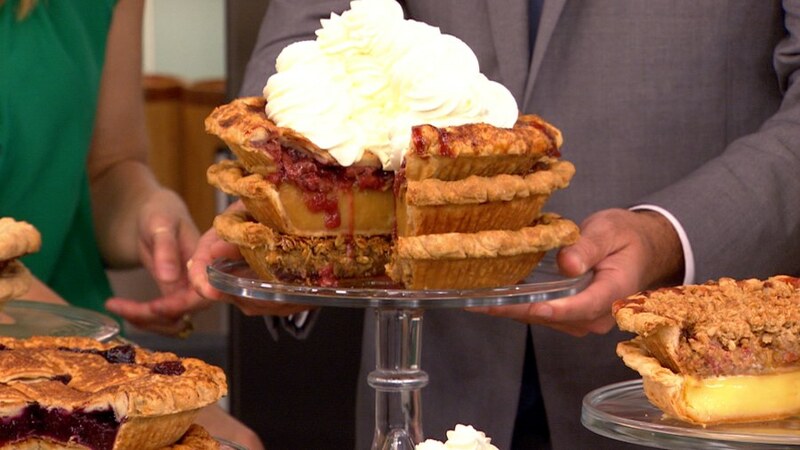 Stack pie is pretty much exactly what it sounds like; a stack of different pies, layered one on top of the other (usually with a thin layer of caramel in between each to help them stick), and cut together in order to give you a triple/quadruple/quintuple tiered slice of pie. As the story goes, this ingenious technique was designed to help people carry multiple pies to events with ease instead of having to juggle multiple at a time (quite the predicament back in the day apparently). The article cites it as the "pre-tupperware solution" to dessert transportation. I'll take caramel and pie over pyrex and plastic any day. Since the thought of cooking right now makes me want to curl up in fetal position under a huge blanket on my couch, stack pie seemed like an ideal day-after-Thanksgiving recipe. No baking or cooking required, just unwrapping, arranging, and slicing. And, lets be honest, on what other day of the year would you just happen to have multiple pies lying around? 1. It's Thanksgiving (weekend), crazier amounts of food have been eaten I'm sure. 2. It's Thanksgiving (weekend), the day of celebrating traditions and stack pie is about as retro a tradition as it gets. 3. It's Thanksgiving (weekend) and you deserve it! Cheers and happy resting everybody.